In a recent online survey, it was reported that 84% of the 1,126 women surveyed didn’t use sunscreen as a part of their daily beauty routine. The survey was conducted by the Green Beauty Barometer on behalf of Kari Gran. 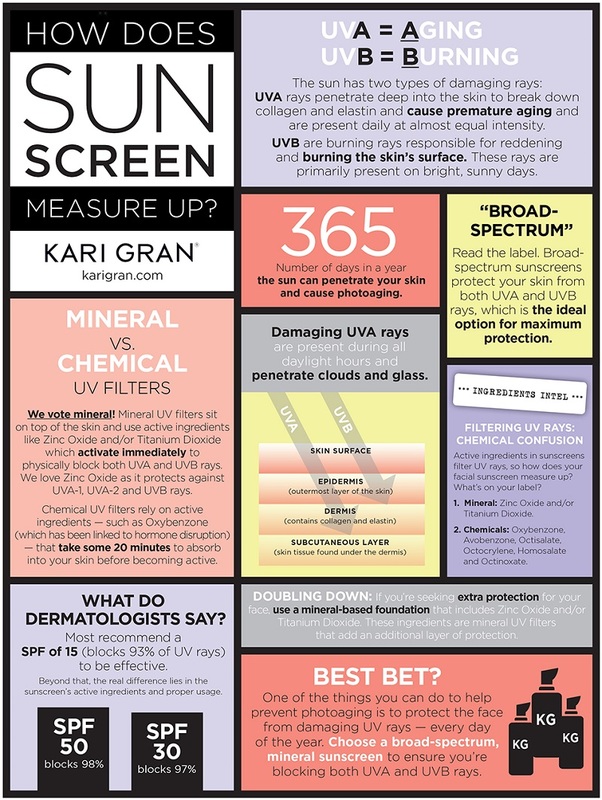 In an effort to better educate people on sun protection, Kari Gran has also released an infographic on best practices when choosing a sunscreen. Some tips include the following. UVA rays cause aging, whereas UVB rays cause burning. Use an SPF 15 (blocks 93% of UV rays). “Broad-spectrum” products are the best for maximum protection. Add in a mineral-based foundation for extra sun protection. "I believe facial sunscreen should be viewed just like a cleanser or moisturizer – a can't miss step every day," added Kari Gran, founder of the Kari Gran brand. "Also importantly, while many women wear skin care and makeup products with SPF in them, it may not be doing the job. Typically, the added sunscreen is made with ingredients such as oxybenzone, which has been known to break down after a few hours of exposure and linked to hormone disruption."